Includes: 1099 Master Guide, training video + three attempts at exam within one year of purchase. Accurate payment reporting is a critical function in AP, and earning certification in this area of accounts payable demonstrates to your employer that you are dedicated to achieving 100% compliance. 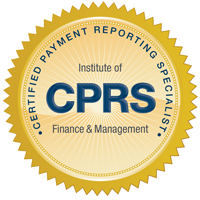 Employees who have earned the CPRS designation can play a key role in ensuring accurate reporting and fine avoidance - improving the bottom line and increasing your value to the organization.